Many people have a vinyl record or LP music collection with rare or personal recordings that cannot be found in a digital format. 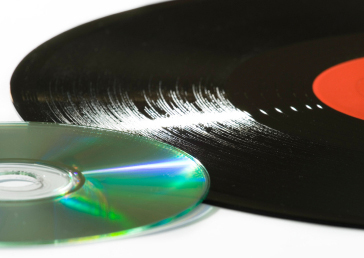 Over time, these vinyl records will warp and may have built up scratches from improper handling, both of which can lead to diminished sound quality. 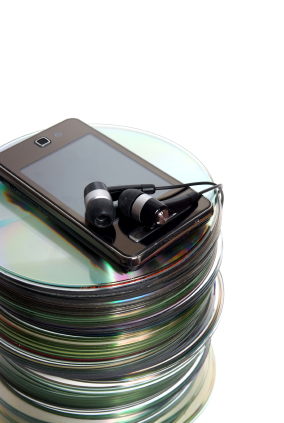 It is a good idea to convert your old record to CD or to a computer or iPod friendly file format to preserve the quality and make the recordings more convenient for listening. Two Squares can convert 78, 45, or 33 RPM records to either CDs or for use on your computer or iPod. One of the most critical parts of the process of capturing a record is proper cleaning of that record. You also need to understand that all records are not the same. Vinyl records can be cleaned using an alcohol based solution, but shellac, acetate, and other older pressings need alcohol free solutions to avoid damaging the records. Two Squares has the experience, tools, and a variety of safe cleaning chemicals to ensure the cleanest possible surface. Proper handling of old vinyl records is very important as vinyl is relatively easy to scratch and the vinyl itself builds up a static charge that attracts dust over time. 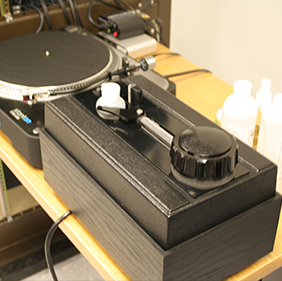 The technicians at Two Squares are trained to properly handle old vinyl, shellac, acetate or lacquer records. All records are inspected and then cleaned with a special solution to clean and prepare the grove surface for the record to CD transfer process. For very old and damaged records with skips, Two Squares has several techniques to avoid or minimize skipping by reducing the playback speed or even playing a record backwards during the digital capture. Our technicians will then re-adjust the audio to the proper speed/direction during post processing. 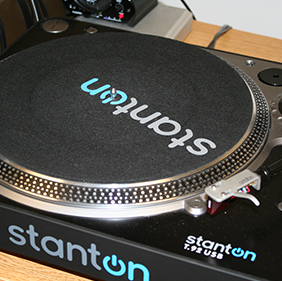 There are low cost USB turntables available to consumers that connect to your computer that will yield a low quality capture, but a high quality conversion requires a high end turn table with a pressure controlled (weight balanced) armature and the appropriate needle selection for the album speed considering that not all record grooves are the same. 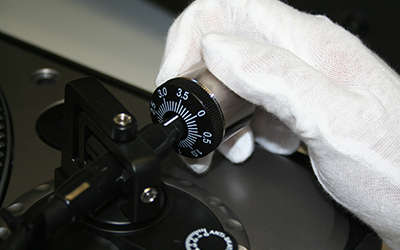 In the image to the left a Two Squares technician balances the weight of the needle on the surface of the record. This will minimize skips caused from scratches as well as the hissing and warbles that are common with older warped records. The weight balance will also ensure that, along with the proper needle, the needle will sit properly in the groove and optimally pick up the desired audio. It is important to note that the stylus for a 78 rpm record is different (larger) than the stylus for a 33 rpm or 45 rpm record because the grooves for the 78 records were wider than the 33/45 records. This means that if you use a stylus designed for a 78 record on a 33/45 record, the stylus may skim across the record because it doesn’t fit properly into the groove. Conversely, if you use a stylus designed for a 33/45 record on a 78 record, the needle will sit at the bottom of the groove and pick up additional noise. Using your computer’s line inputs on your sound card or motherboard sound interface for audio capture can affect quality as well. Computers have a lot of “electronic noise” from switching circuits and fans that will bleed into your capture that will cause unwanted noise and hiss. Even for a non-audiophile listener, this can be a very noticeable. The best quality comes from properly grounded, external (from the computer) studio grade digital conversion devices. Two squares uses only studio grade audio equipment that is professionally maintained and tuned to ensure the best possible digitization quality. The next step in producing a quality conversion/transfer of your record to CD is in the post processing. There are many cheap software programs available that claim to improve the quality of you digital recording by removing pops and hisses. But when it comes to purchasing post processing software, you definitely get what you pay for. Cheap and free programs will remove some of the noises that you want removed, but will also remove noises, features and quality of the music that you don’t want and actually make your recording sound worse than the unprocessed recording. Two Squares has the experience and professional grade software tools to provide you with the best possible conversion. Two Squares can convert the audio from a vinyl record to a set of MP3 files which can be copied to an iPod, iPhone, Android, computer, hard drive, or flash drive.